I’ve left for 15 days and I sculpted all veggies in advance and scheduled the posts on tumblr and facebook. I did quite some odd fruits again and some mushrooms to cheer things up a bit. Sometimes it is a bit sad to think I will probably never try the fruit I’m sculpting, like the pandanus conoideus. 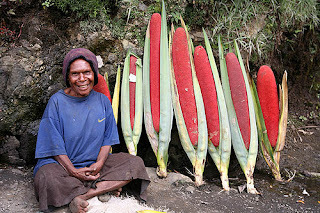 It is the big red thing that looks like a huge red corn – it actually can be 100 cm big and I made a 50 cm version – but there are different varieties, so I suppose I’m good – I mainly worked from photographs to check sizes. Making everything in advance was a lot of work, but it was also really nice to finally use the scheduling tools on tumblr and facebook. I plan to sculpt the veggies more in advance and schedule posts more as well, it is such a time saver! I will very likely blog about the social marketing so I’ll be sure to talk about the scheduling of posts as well. I never heard or seen the pandanus conideus before, such an odd looking fruit! I wonder what it tastes like 🙂 The amount you made so far and the details of each and everyone is so amazing! I had not hear about pandanus conideus before. They are huge! What an interesting looking fruit. Veggie…. … I mean fruit…. I am all confused now…. top la menthe waouh la passiflore …..
les aubergines le concombre …. Did you know I'm eating more vegetables since I have been following your veggie project? Wonderful work! oh les myrtilles auj !! minuscules et réussies les groseilles bon weekend!